That’s right. It’s the rice, not the fish, that is, quote unquote, “sushi.” Sliced fish, usually skewered, is actually called sashimi. If you didn’t know this, and even if you did, stay tuned for plenty more about the wonderful world of Japanese restaurants. Sushi rice is actually vinegared rice, with the vinegar providing taste that rice alone would not. Also, Japanese rice is a type that neither clumps together to insane levels, nor is too long-grained to clump properly at all. Instead, it’s a sort of middle ground, requiring paste to really retain a clump. A very common way to get sushi rice to stay together is by using nori, a type of seaweed. A young man of college student age, named Akira is entering a restaurant with his girlfriend, a woman of similar age named Naomi. A waitress comes to greet them, making a bow. Waitress: Irrashaimase. Nanmei-sama desu ka? Waitress: Welcome. How many are in your party? Waitress: Please, right this way. Irrashaimase is an over-the-top, honorific method of speaking. “Irasshai” is less over-the-top. However, a high class restaurant will use this archaic way of speaking to show customers the highest possible level of respect. Strictly speaking, in linguistic terms, this is to raise the customers to the highest respect level, above that of the host/ hostess. Nanmei: How Many Names Have You? Taken too literally, “nanmei” is a compound word with “nan” being a “what?” type question, and “mei” being “name.” It’s really like asking how many heads of cattle there are in a herd, except we’re talking about people, not cows. At any rate, it’s simply being polite. Futari is a word that is, in kanji, literally “two” + “people.” Thus, two people, a pair, a couple, and so forth. In response to this kind of question, “two people” seems a good way to look at it, but the word itself is more flexible than this. A literal “party of two” would be “futarizure” (“tsure” at the end of a compound > “zure”), but what’s the point of being so technical? It’s the hostess trying to bend over backwards so that the guest can relax. You will see this point arise again. Speaking more literally, we could take this like, “By all means.” That is, by all means, take your time. In reading this too literally, we would miss a more idiomatic sense: “Please.” It’s a gentle and friendly way of saying please that does not imply an obligation, but which confers right-of-way to the customer. “Kochira” is quite literally this way, as in, this side, in the direction I am standing in. We did not see either a copula (which works like is/ am/ are, like desu above) or a verb for the last sentence. Technically we didn’t see a “topic” either (in crude terms, the subject of the sentence) because the customers are well aware that they are the topic. Nor does the waitress need to spell out that they should walk in her direction. This is obvious. Japanese is a need-to-know language. If you already know it, people don’t want to say it and waste your precious time. This is another feature of normal Japanese speech that is good to remember. 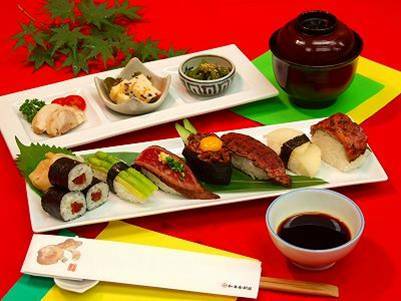 This entry was posted in Grammar, Japan, Tourism and tagged culture, food, Japan, restaurants. Bookmark the permalink.